For 130 years, the Sisters of Charity of Sts. Bartholomew Capitanio and Catherine Gerosa, better known as the Sisters of the Child Mary, worked tirelessly in Brignano and produced abundant apostolic fruits. However, much to their regret, they were obliged to close down their community there a little over a year ago. The parish priest, Fr. Luciano Manenti, then asked us to take over. 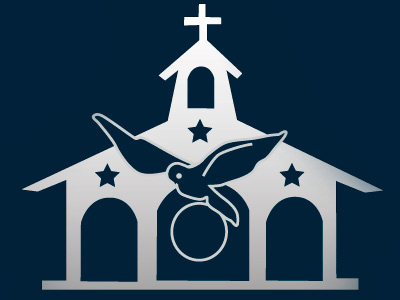 The appointed date to begin this new foundation was October 22th, the day that the Church celebrated for the first time the memorial of Blessed John Paul II. Father Rafael, the founder of the Home of the Mother, celebrated the first mass in the Sisters´ new house; afterwards, the Lord was placed in the taberncale. Fr. Felix was present along with Br. 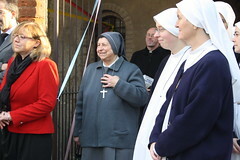 Jose Luis, both Servant Brothers of the Home of the Mother; the Sisters of Brignano: Sr. Isabel Cuesta, Sr. Rocio Galmes, and Sr. Emma Haynes; Mother Ana along with three other Sisters from Zurita, Spain: Sr. Karen, Sr. Elisa, and Sr. Mercedes; and also the Sisters from Rome : Sr. Gema, Sr. Maria Luisa, Sr. Laura, and Sr. Caitlin. During the homily, Fr. Rafael spoke about how we always have to be united to God´s Will so as to give Him glory. He explained that the heart of the Sisters´ homes has to be the Most Holy Sacrament, to whom we have to constantly turn to for help. We cannot take His presence for granted; instead, we should remember that He is there and open up the Chapel door often, visiting Him, asking for His help, and thanking Him. When mass was over at the new house, we went to mass at the parish. When mass was over, the Most Holy Eucharist was exposed until 11:30 at night. They wanted to welcome us in this way because they knew that the Home´s first mission is the defense of the Eucharist. We were moved by the spirit of devotion and silence with which the people prayed there. The Lord was accompanied the whole time by many people, above all, young people. 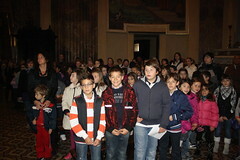 On Sunday, the 23rd, the welcoming ceremony was held in the parish. 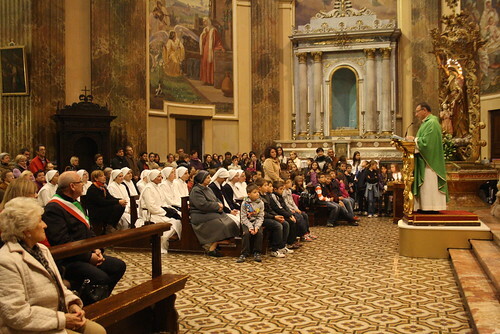 The Sisters from Lumezzane were also able to attend the celebration: Sr. Teresa, Sr. Sara, Sr. Anna, and Sr. Hope, who were accompanied by their parish priest Fr. Tino Bergamaschi and a large group of familias from Lumezzane who form part of the Home of the Mother. We all met in St. Andrew´s Church. 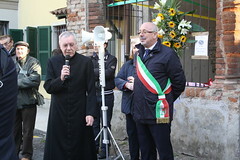 The mayor of Brignano, Mr. Valerio Moro, gave the welcoming speech to the Sisters. The parish priest also spoke a few words and then we left in procession – accompanied by the band – for the parish church, where Holy Mass was celebrated. In his homily, Fr. Luciano Manenti gave thanks to the Sisters of Charity of the Child Mary for the Congregation´s 130 years of pastoral work in the parish. He also thanked Fr. Rafael, the Servant Sisters, Our Lord, and the Blessed Mother for our presence in the parish, where we will continue the line of apostolic labor carried out by religious in the town. After communion, Fr. Rafael also spoke, giving thanks for the parish´s welcome, hoping that this new community will produce fruits that will give glory to God. When the Eucharistic celebration drew to a close, everyone headed to the Sisters´s house. Sr. Pier Rita, who had been the superior of the Sisters of Charity of the Child Mary´s community in Brignano, officially handed over the keys of the convent to Sr. Isabel Cuesta, the superior of the community of Servant Sisters in Brignano. Sr. Pier Rita thanked the Servant Sisters for having accepted the parish priest´s petition to found there and Sr. Isabel in turn gave thanks for the extensive work that the Sisters had carried out for more than a century in the town. Lunch was held afterwards in one of the rooms in the parish hall, a building which makes up part of the complex where the Sisters live. Later on, a large group of children, accompanied by their parents and catechism teachers, came to see the Sisters and we we spent time talking to them and singing. We then visited the nursing home in the town, where the Sisters will frequently go to bring communion to the elderly. That night, we had a meeing with young people from the parish, along with a priest of the parish who is in charge of the parish youth. They had prepared a musical skit for us, along with a game. It was a day truly full of activity. We place in the hands of Blessed John Paul II the Servant Sisters´ new foundation, which we hope, as Fr. Rafael said, will give glory to God. If you want to see the news report in the Cremona diocese´s official webpage (written in Italian), click here. They also published a picture gallery.